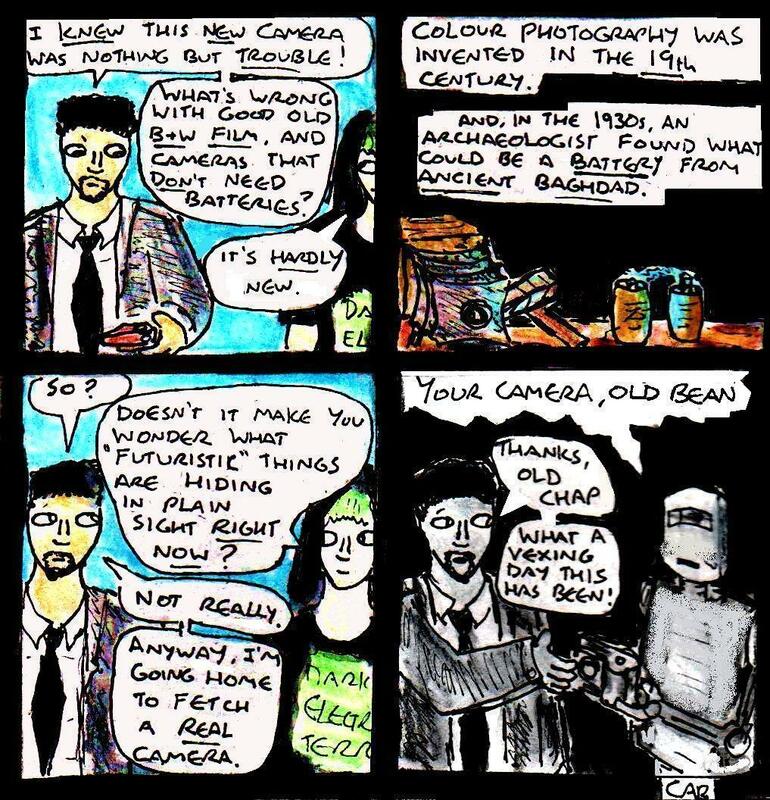 This is the second comic in “Damania Repressed” and, although I’m hoping that this mini series will be fairly self-contained – it follows on from the events of this mini series (which, in turn, follows on from this one). Links to more mini series can also be found on this page. Well, it’s the end of the month, so that means that it’s time for my usual list of links to what I consider to be the ten best articles about making webcomics, making art and/or writing that I’ve posted here over the past month (and possibly a couple of honourable mentions too). Unfortunately, due to being busy with a couple of upcoming webcomic mini series and due to the hot weather at the time of writing some of this month’s articles (I write them quite a few months in advance), the best articles posted here this month mostly seem to come from the beginning of the month. Still, here’s hoping that March’s articles will be better. This is the first comic in “Damania Repressed” and, although I’m hoping that this mini series will be fairly self-contained – it follows on from the events of this mini series (which, in turn, follows on from this one). Links to more mini series can also be found on this page. But, yeah, Harvey tends to have something of a habit of not really thinking of highly-advanced technology as being “unusual” (however much he might dislike modern technology). If you’re making a webcomic, it can be very tempting to include all sorts of obscure/nerdy references and in-jokes in your comic. After all, it’s a really fun thing to do. However, if you aren’t careful, you can end up confusing and bewildering a large portion of your audience. 1) Mention it: This won’t work in every context, but sometimes a good way to avoid confusing people with an obscure reference is to mention what the reference is. The dialogue is a parody of “Howl” by Allen Ginsberg (or the one part of it that I can remember at least). But, since many people haven’t heard of “Howl”, I thought that I’d briefly mention Allen Ginsberg in the dialogue (in case anyone wanted to look him up on Wikipedia or whatever). You can also do something similar to this in your dialogue by having your characters say something like “This is just like that one time in ‘Star Trek’ when…” or something like that before making a reference and/or in-joke. Obviously, it isn’t practical to do this kind of thing for all of your in-jokes and references, but try to do it for at least a few of them. 2) Independence: Ideally, if you’re making an obscure in-joke or a reference, then try to make sure that the humour doesn’t rely entirely on the audience understanding the reference. In other words, either surround the in-joke with lots of “ordinary” jokes or tell the joke in such a way that the audience can still find it funny from the context (regardless of whether they’ve read or seen the thing you’re referencing). For example, the scene immediately before the comic panel I included earlier shows Roz (the beatnik character) offering Harvey (the detective) a joint. If you’ve read “Howl”, then the dialogue in the example is a funny parody of the poem. If you haven’t read “Howl” – it’s also an amusingly cynical, if strangely-phrased, description of how people sometimes act when they’re stoned. So, try to include at least a few “dual-purpose” references in your comic, which are funny regardless of whether your audience gets the reference or not. 3) Background details: This one is fairly obvious but, in comics, the best place for super-obscure references and in-jokes is often in the background details. Since precise background details aren’t often essential to the plot, the references will probably be ignored by people who don’t get them – but noticed by people who do. So, you can add a lot of obscure humour for people with the same interests as you, but without ruining the experience for people who haven’t read the same books, played the same games etc… as you have. Well, after finishing this webcomic mini series, I felt like making something fairly “quick” for today. Plus, since the next mini series will probably be set in Victorian times, I thought that I’d practice making gothic Victorian-style art (I probably need more practice at drawing paraffin lamps though, since the lamp in the painting looks more like a bong than a lantern LOL!). If I remember rightly, there weren’t that many major dialogue changes between the line art and the finished comics – the most major change was probably to the dialogue in the fourth comic (since the condemned man was originally going to be the castle’s dungeonkeeper, until I realised that it would be funnier if he was the executioner instead). You can see a larger version of each picture in this post by clicking on it. Well, in case you missed any of it, here are all eight “episodes” of “Damania Renaissance” a webcomic mini series that sort of tells a story (or, more accurately, a self-contained chapter of a larger story). Although this mini series can be read on it’s own, it also follows on from the events of “Damania Retrofuturistic“. If you want to see some completely self-contained webcomics, then check out the ‘2016’ section of this page. All in all, this was a rather strange mini series. Not only did it end up having something of a continuous story (which is something I’d previously tried to avoid in my four-panel webcomics), but I also made the whole thing in just two days. This can probably be seen in the comic, with the first four episodes having a slightly different style of humour to the last four. Likewise, the seventh and eighth episodes are slightly on the weak side, due to the fact that I was feeling a bit exhausted by then. If you’d told me a couple of months beforehand that I’d be making a medieval fantasy comic mini series with a continuous narrative within two days, I’d have probably laughed at you. Making this mini series was certainly a strange experience. As usual, the eight comic updates in this post are released under a Creative Commons BY-NC-ND licence. Likewise, you can click on each comic update to see a larger version of it.